Preview Final Day: Homework completed correctly? Inspired performances on the penultimate day of action at the Seamaster 2018 ITTF World Tour Czech Open in Olomouc; on the concluding day of action, Sunday 26th August, equally enthralling contests surely beckon. Are the outcomes just too close to call? In three of the finals Chinese players appear and there is always the feeling that both players and coaches will have done their homework thoroughly. Zheng Peifeng appears in the Men’s Singles final, no current world ranking owing to an absence from the international scene, he competes in his first ever ITTF World Tour final; his opponent, Portugal’s Marcos Freitas, the no.4 seed, has appeared in two such title deciding contests and is no stranger to winning in the Czech Republic. He won in 2014 in Olomouc, having three years earlier been the runner up in Rio de Janeiro. Meanwhile, in the Women’s Singles title decider, the situation is somewhat different After saving seven match points at the quarter-final stage against last year’s winner, Japan’s Mima Ito; is destiny on the side of Wen Jia? Kasumi Ishikawa, also from Japan and last year’s runner up, may have other ideas; she will be competing in her 14th career ITTF World Tour Women’s Singles final, to date she has won eight times. Somewhat differently for Wen Jia, she has made three appearances and has two wins to her name. A contest in the balance, as is the Men’s Doubles final; Germany’s Patrick Franziska and Denmark’s Jonathan Groth, the top seeds and defending champions, meet Sweden’s Mattias Falck and Kristian Karlsson, the no.4 seeds. Overall Patrick Franziska and Jonathan Groth have competed in four ITTF World Tour Men’s Doubles finals, the have won three times. 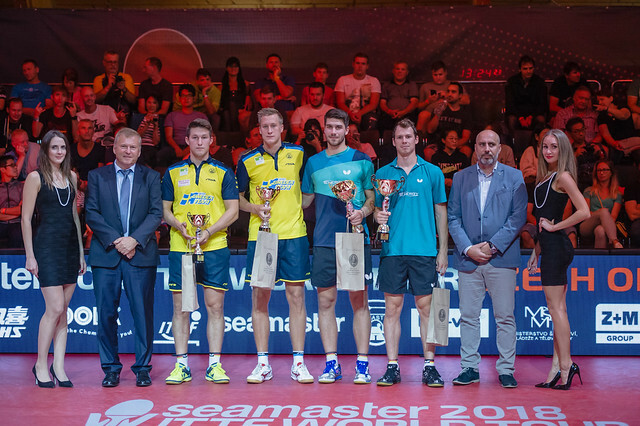 The record for Mattias Falck and Kristian Karlsson is three finals and one title; notably they were the runners up in Olomouc in 2012 the first year the tournament was staged. Evenly matched pairs but in the Women’s Doubles final, China’s Liu Gaoyang and Zhang Rui start as clear favourites; the runners up last week in Budapest, their first appearance as a partnership, they meet the combination of Croatia’s Sun Jiayi and Singapore’s Zeng Jian, a pairing together for the very first time. The finals’ programme is due to start at 12.00 noon (local time).